That's no kitchen timer! Oh wait, sorry. It's no moon. It is, in fact, a kitchen timer. 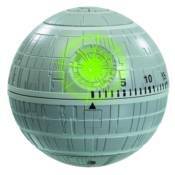 Simply rotate the top hemisphere to the required time to start the countdown (up to 60 minutes) your Star Wars Death Star Kitchen Timer will let out a ring when the timer reaches zero. Simples. With a rubber base to prevent surface scratches, the Star Wars Death Star Kitchen Timer will make the perfect kitchen instrument for any budding imperial chef!